Anu is loved and respected! After living in Canada for almost 20 years, Anu Saxena felt it was time to get involved; she wanted to give back to her community. In 2011, she began volunteering with the Guelph & District Multicultural Festival (GDMF); the perfect opportunity for her to explore the various aspects of volunteerism and learn more about her community. Each year the GDMF puts on a world-class, free, and accessible festival, bringing the community together to learn and enjoy different cultures, traditions and cuisines from around the world. Ask anyone what they most enjoy about the Guelph & District Multicultural Festival and the answer will most likely be “the foooood!”. With up to 25 different cuisines by a variety of vendors from as far as Toronto and Niagara Falls, the Food Tent attracts foodies with an appetite for the exotic each year. The GDMF generates cultural awareness and funding for local community groups and businesses, fostering economic development in the community. The festival would not be where it is today without Anu’s dedicated organization and sheer hard work. 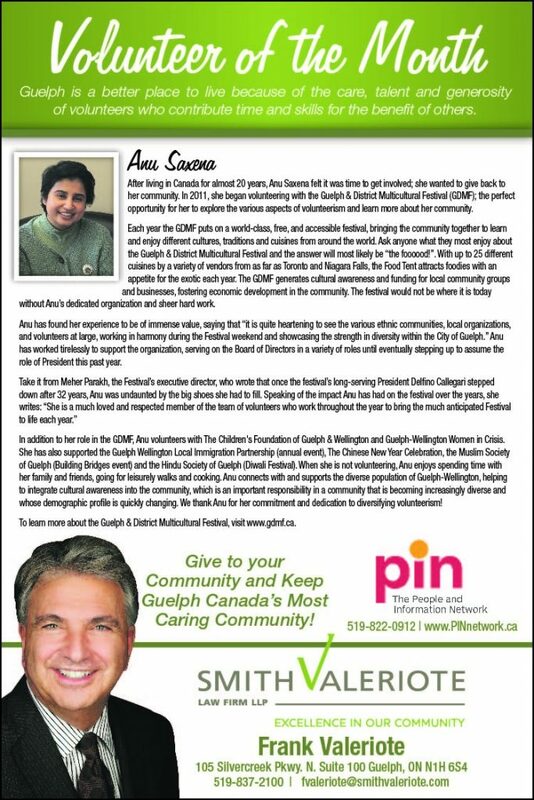 Anu has found her experience to be of immense value, saying that “it is quite heartening to see the various ethnic communities, local organizations, and volunteers at large, working in harmony during the Festival weekend and showcasing the strength in diversity within the City of Guelph.” Anu has worked tirelessly to support the organization, serving on the Board of Directors in a variety of roles until eventually stepping up to assume the role of President this past year. In addition to her role in the GDMF, Anu volunteers with The Children’s Foundation of Guelph & Wellington and Guelph-Wellington Women in Crisis. She has also supported the Guelph Wellington Local Immigration Partnership (annual event), The Chinese New Year Celebration, the Muslim Society of Guelph (Building Bridges event) and the Hindu Society of Guelph (Diwali Festival). When she is not volunteering, Anu enjoys spending time with her family and friends, going for leisurely walks and cooking. Anu connects with and supports the diverse population of Guelph-Wellington, helping to integrate cultural awareness into the community, which is an important responsibility in a community that is becoming increasingly diverse and whose demographic profile is quickly changing. We thank Anu for her commitment and dedication to diversifying volunteerism! To learn more about the Guelph & District Multicultural Festival, visit www.gdmf.ca.